Is there a miracle more magical than childbirth? I don’t think there is. It’s a wonder how we’re brought into the world. Childbirth can be even more strenuous but fascinating when you give birth to twins. Let’s be honest, there’s nothing cuter than seeing twin babies hugging. Some people say that a sibling bond between twins is like no other. If you’re sceptical of this statement, we may just have the video evidence to change your mind. It certainly changed mine. These adorable twin babies hugging during their bath is the cutest thing we’ve seen all week! 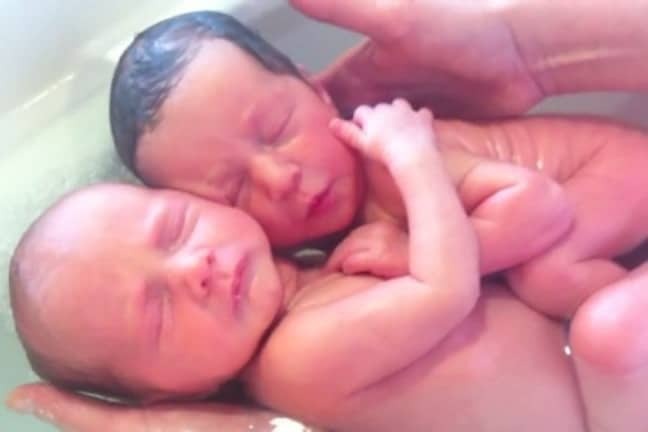 Mere minutes after a set of twins were born, French nurse Sonia Rochelle got out her camera to film her signature bathing technique for newborns which she calls the “baby spa”. The two adorable newborns don’t seem to be aware that they’ve been born yet as they tenderly hold on to each other in a loving embrace as they’re bathed. If you’ve never fancied having kids, this tender moment may just change your mind. It certainly is the sweetest thing I’ve seen all week! Please, can I get one?